Let's talk art layers! I mentioned that my pages have about 12 layers per panel, and a lot of my comicmates here and elsewhere were surprised! So I thought I'd post a screenshot and ask everyone what their layers look like! Do you break everything apart into different sections? All one layer? How do you name them? Do you split them up per panel? 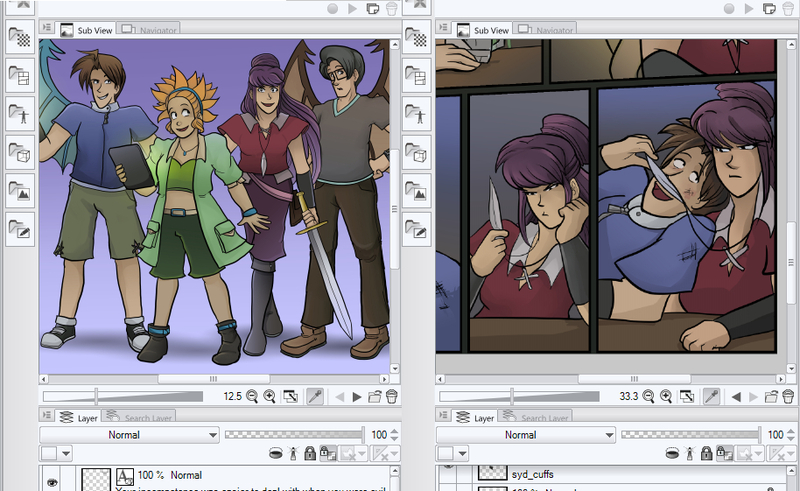 I'd say I average around 10-14 layers (excluding word balloon layers). When I was only doing b&w it was 4-6 layers. These are my cleaned up layers. (This a needed layer for me because of my shading style. That's a whole new topic.) I find it useful to have as a quick mask or if I do a transparency on any layer above it. The layer over that is clothes, hair and eyes. With sometimes another layer to fight paint bleed but they get merged into one asap. Hair is it's own layer for all the five minutes it takes to fill in then it's merged. I used to be a chronic layer abuser and would have upwards of 20. Needless to say, I've learned to condense. I talked about this in the skype thread, but I like to keep it simple- one layer for lineart, one for all character base colors, one or two multiply layers for shading. Plus a few extra here and there for things like highlights, Vector's eye glow, etc. Backgrounds have the same deal. Also, my lineart is threshholded so I can use the paint bucket tool to lay down flats- base colors is usually the fastest step of he process. 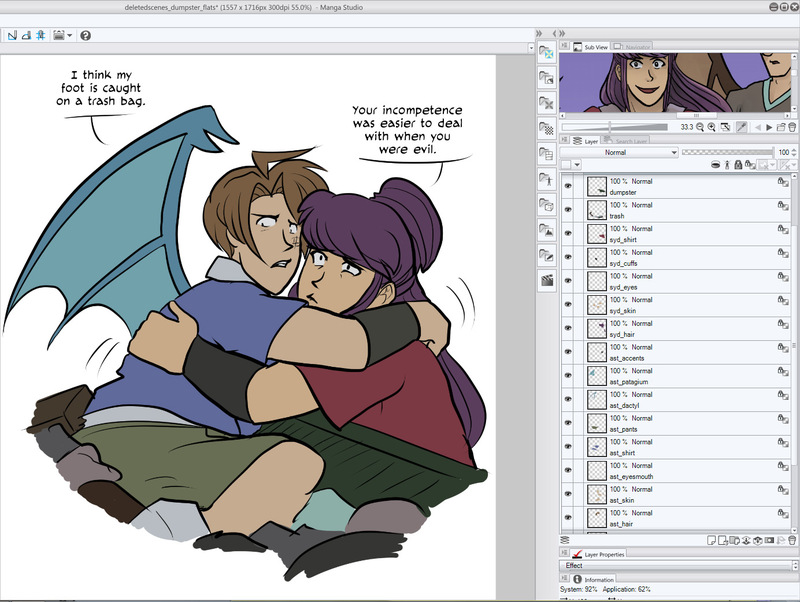 I put a lot of effort into streamlining the drawing/coloring process so I don't have to be chained to a single page for more than a few hours. I favor efficiency and speed. The average Castoff page only has a handful of layers- I keep the important ones named just to make it easier to keep them all straight, but once it gets into effects it gets a little more unorganized (cuz if I'm doing effects it means I'm almost done so I just kinda steamroll through it NAMES BE DAMNED). I divide it up into groups: "Dialog" (with all the words and the word bubbles), "SFX" (sound effects- I usually just stick those in with the dialog though), "FX" (usually filled with dozens of unnamed layers set to multiply or overlay), "charas" (All character stuff- inks, base colors on one layer, and a shading layer or two), and "backgrounds". 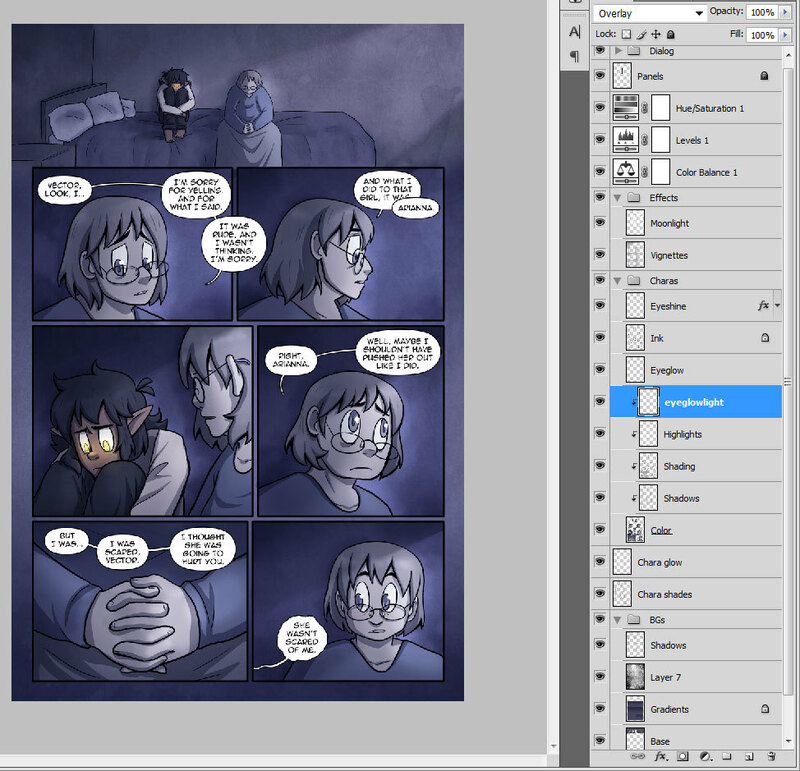 Average page is about 20 layers (not counting dialog and color adjustment layers). Also: I also have a separate document I keep open while working on pages so I can grab base colors easily- I either copy-paste it onto the page while flatting or keep it open off to the side so I can eyedropper from it. I add and subtract stuff from it as I need to- the pink "Fx" colors are for Shame Cube, the current shading color, and base colors for 2 current side characters so I don't have to open a bunch of pages and dig around for their colors. Your process is pretty similar to mine, Star! ......except I am not organized enough to name my important layers (when I'm not at work), and I don't keep a swatch file handy. 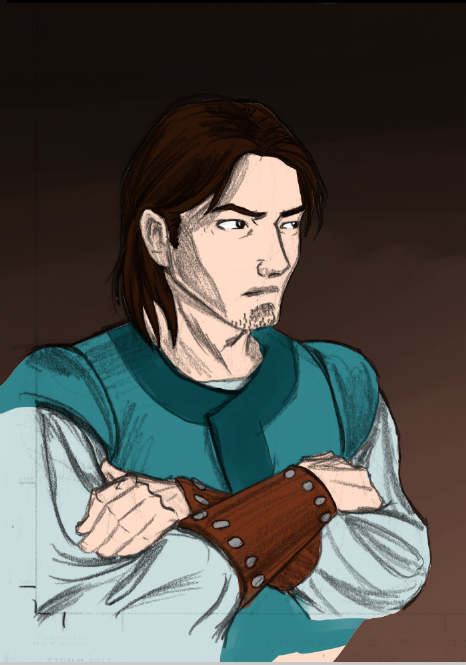 If I started digitally colouring my comic I probably would, but for my occasional coloured image I usually just do it by eye/base it on situational lighting. 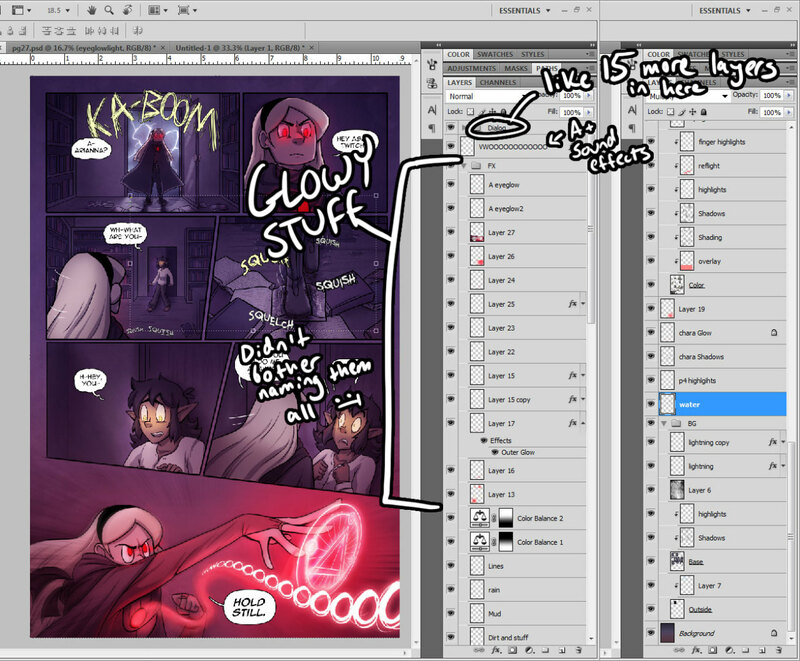 My comic pages themselves are pretty boring, for..... um, obvious reasons, but I do have a standard layer structure to keep my margins and text layers organized. 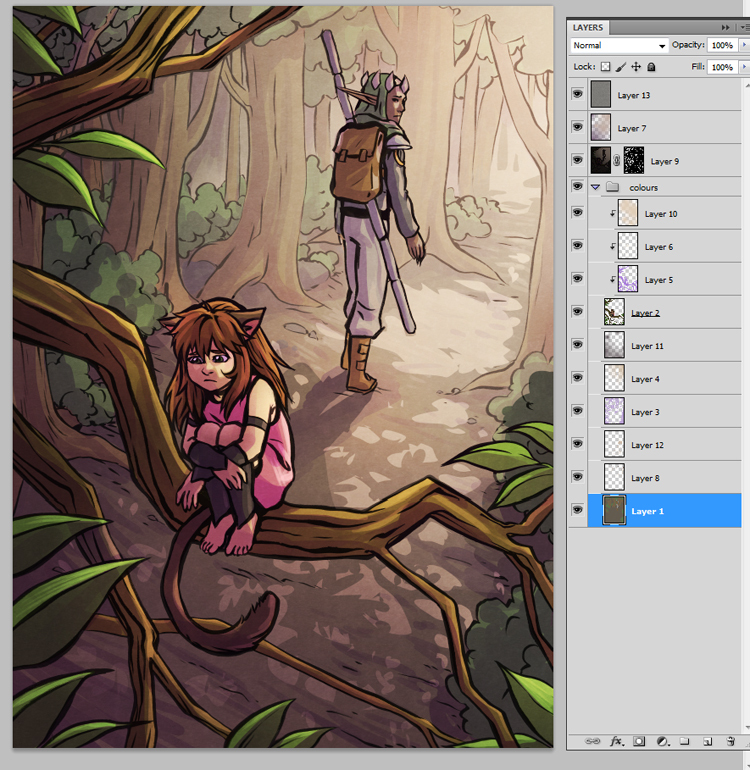 I love using clipping masks on layers, especially for adding colour to lineart. I've also wholeheartedly fallen in love with layer masks! But yeah my usual structure is a solid background (with other bg details on layers above it), then the characters' flats all on a single layer (with shading on multiply layers clipping-masked above it, and then grouped so I can minimize it whenever I need to), then any effects or textures or overlays I want under the lineart, then the lines (and any colours applied to the lines clipping-masked on top), then sometimes another round of Overlay to brighten or darken selective patches. Oh my God. This is a great idea! Why am I not already doing this?? I have this as well but I have it because with out it I would get the colours all wrong all the time cause I'm partially colour blind. Actually I think I may have you beat on layers Delphie, because I work in gradiants. Of course all you are seeing here are the layers for Val alone and it's not even all of them, there are 29 all together. 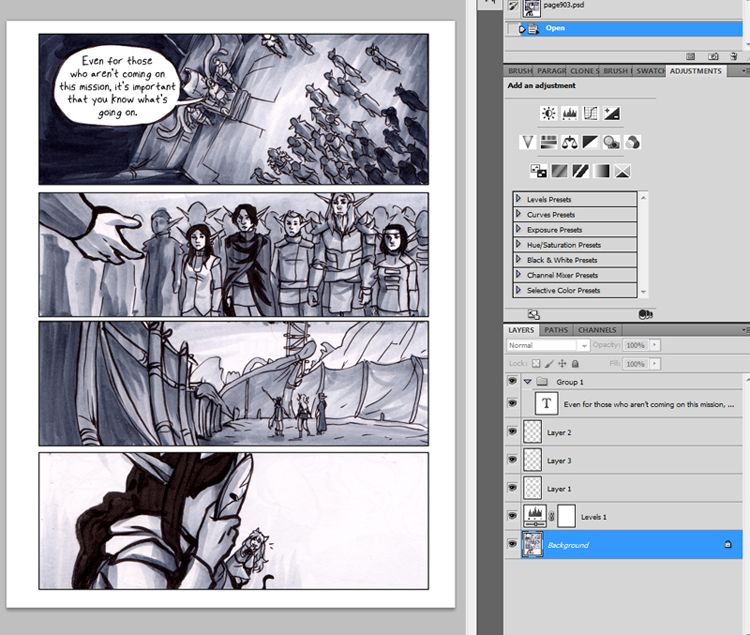 I try to use the same layer 'base' for all the page except I have overlapping panels, plus a multiply layer over it. 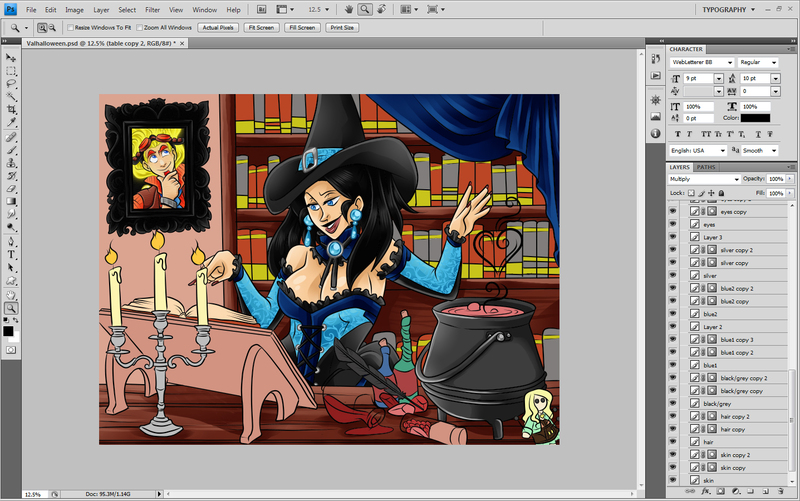 Also one of 2 shade layers for the backgrounds, and some gradient layers. 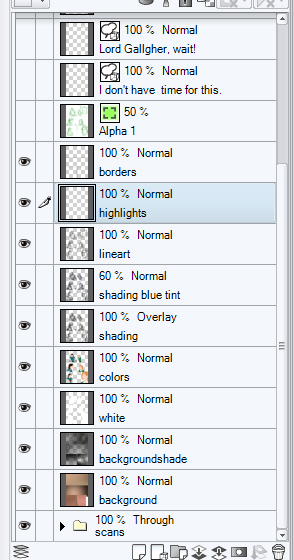 I usually name or give colors to the layers and groups, but sometimes I'm a bit lazy. I use 2 layers. 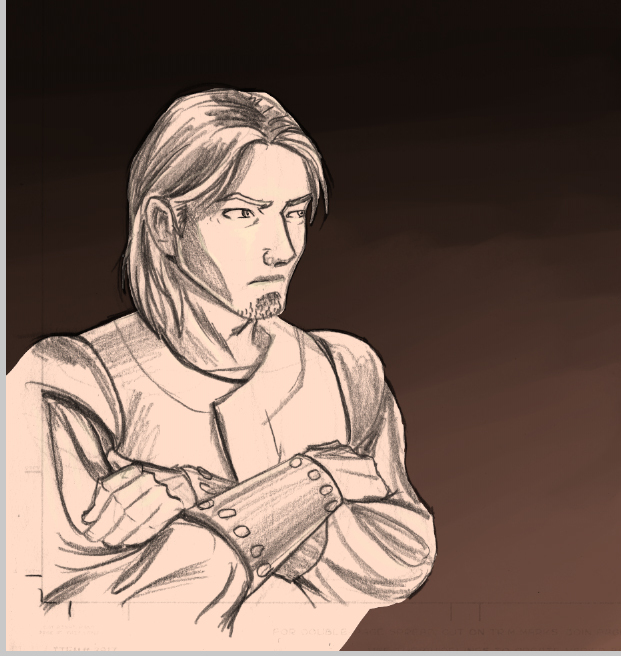 One for lineart, one for shading. Though I could easily do it with one, since everything is threshholded and aliased. 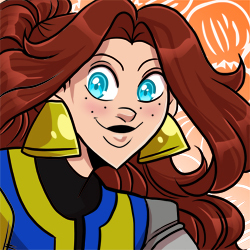 If I were doing flat colors it would be the same. For flat colors with shading and gradients, I would probably duplicate the flats layer once I have it, then keep it hidden, so I could magic wand the shapes there to shade on the other layer. To avoid the dancing ants, first thing I do when I set up photoshop is make a keyboard shortcut to Hide Selection Edges. I make it command+comma, which isn't used for anything else. It's right there by my right hand, and I use it ALL. THE. TIME. Pretty much every time I select something. 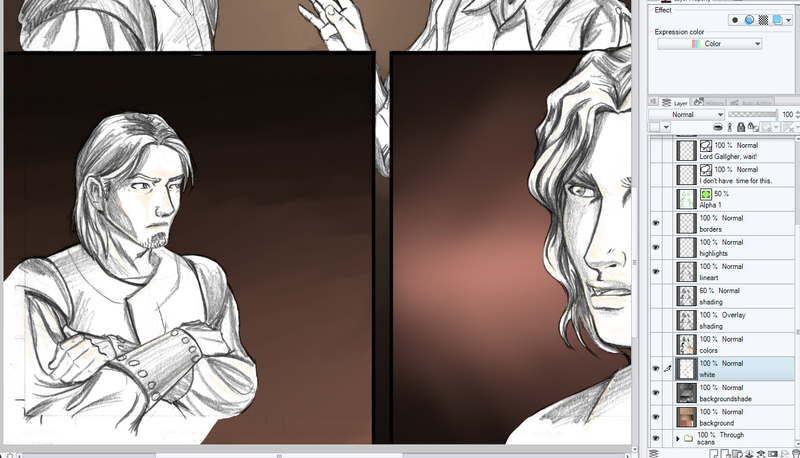 I like to keep my lineart on a layer alone, so all the black is on one layer, and all the gray on the other. Since I don't close all my shapes there's a limit to how much I can use the paint bucket, and so I tend not to when doing the gray. Though due to the complexity of the current page I made an exception to that rule for efficiency's sake. If I did glowy effects or computer lettering I would have a few more layers. The first page there had 6 layers, and the second 7. Though on other pages I did less combining of layers and I have one here that was 21. Though that was primarily due to using letters as characters, and the text tool making a new layer each time you use it. This one only had 2 layers though. One for lettering, one for art. Gahhh, it's so cool seeing how you guys work! I especially love looking at the folks who blend traditional art with digital coloring. You can drag/drop any files into it and they'll stay there, even when you open and close the program, and there's little nav arrows to cycle through them. When you hover over the subview, it gives you the color eyedropper to pull in the colors you want. 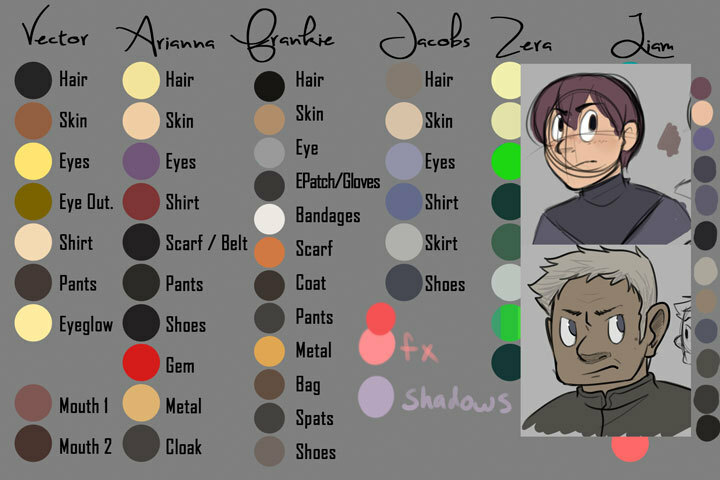 I like to keep a character lineup file open and a recent page to give myself easy access to both character base colors and the colors of their environment! Ooh! I didn't know that was a thing that MS could do, Delphina. That sounds very useful. And Xylo, that soap bubble short is wonderful and made my morning. Damn, that subview thing is an awesome idea! At work I saved some named swatches into a file for the characters, but it's not ideal (because there's no visual context and I have to hover for the names to make sure I'm picking, say, the right shade of orange)-- and I haven't found any good way of working from a swatch file in PS since I don't like toggling between different files as I work, and find pasting my flats reference into a layer in my file to also be cumbersome. 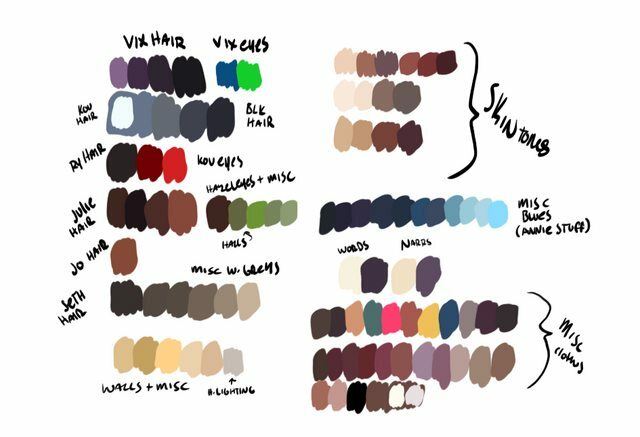 I'll post my layers later but I use the Photoshop swatches for my palette......But I also made a file with them since Photoshop sometimes erases my saved pallet, or I accidentally delete a colour. It's, uhh...not pretty like your guys' fancy ones tho. No, but I do use my mouse left-handed (to ease the stress on my drawing hand). Come to think of it, I might acutally use the shortcut about as often with either hand. It's mostly an easy shortcut because of how close the keys are (on a mac anyway). Since going to the new style, I actually have 2-3 times as many layers, but they actually are saving me time rather than adding it. No more making gradients by hand! WHOOO!